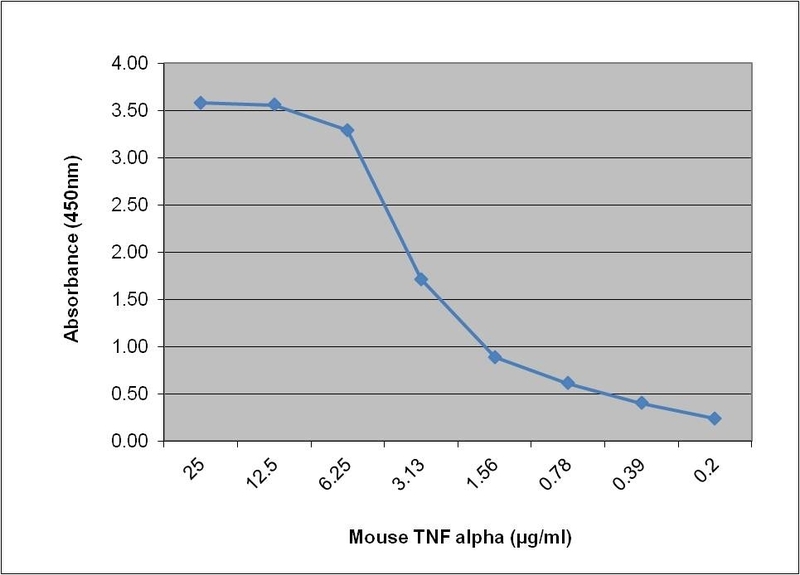 Rat anti Mouse TNF alpha antibody, clone MP6-XT3 recognizes mouse tumor necrosis factor alpha (TNF alpha), also known as TNFSF2. This 17 kDa cytokine is produced by monocytes, macrophages, neutrophils, NK cells and CD4+ T cells. TNF alpha forms dimers and trimers, and is also found as a 26 kDa integral membrane protein. Mouse TNF alpha has cytolytic activity against many tumor cell lines, and has an important immunoregulatory role. Rat anti Mouse TNF alpha antibody, clone MP6-XT3 is reported to neutralize the effects of mouse TNF alpha (Bauman et al. 2003). Recombinant murine TNF-alpha expressed in E. coli. Store at +4oC or -20oC if preferred. 1 Membrane permeabilization is required for this application. Bio-Rad recommends the use of Leucoperm (BUF09) for this purpose. Abrams, J.S. et al. (1992) Strategies of anti-cytokine monoclonal antibody development: immunoassay of IL-10 and IL-5 in clinical samples. Bauman, S.K. et al. (2003) Effects of tumor necrosis factor alpha on dendritic cell accumulation in lymph nodes draining the immunization site and the impact on the anticryptococcal cell-mediated immune response. Infect Immun. 71 (1): 68-74. Hostager BS, & Bishop GA. (2002) Role of TNF receptor-associated factor 2 in the activation of IgM secretion by CD40 and CD120b. Huffnagle, G.B. et al. (1996) Afferent phase production of TNF-alpha is required for the development of protective T cell immunity to Cryptococcus neoformans. Reljic, R. et al. (2004) Mouse IgA inhibits cell growth by stimulating tumor necrosis factor-alpha production and apoptosis of macrophage cell lines. Int Immunol. 16 (4): 607-14.